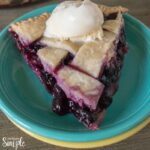 This delicious homemade Blueberry Pie recipe is made with fresh blueberries in a made from scratch lattice crust. Top it with some fresh whipped cream or a scoop of vanilla ice cream. 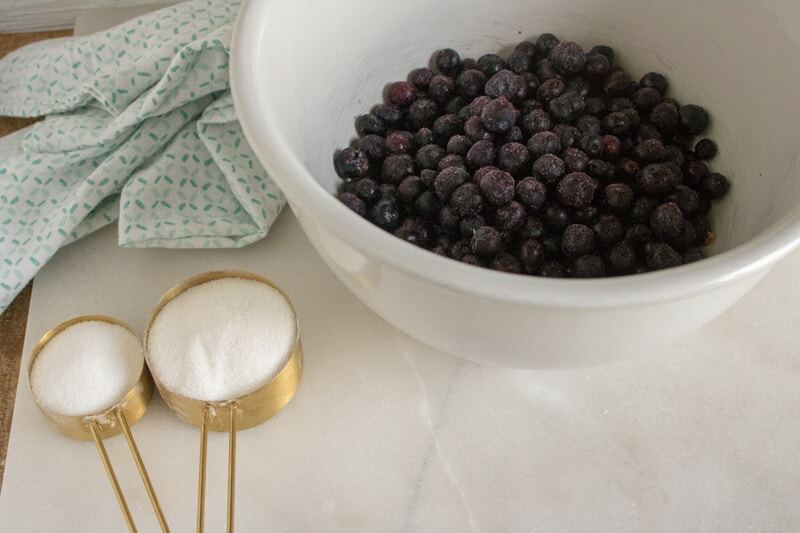 I buy Fresh blueberries when they are in season and I can find great deals on them and I freeze them to use in smoothies, muffins or desserts year-round. 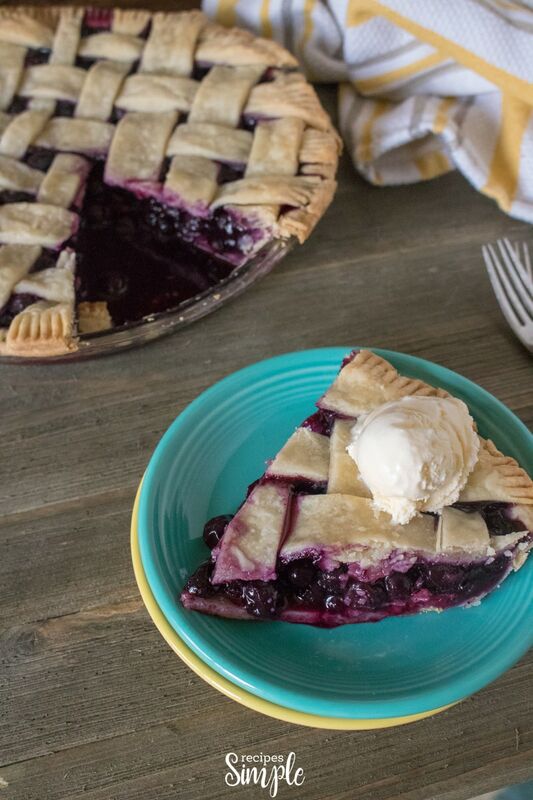 This Blueberry Pie is a delicious classic dessert that I grew up watching my grandmother make. 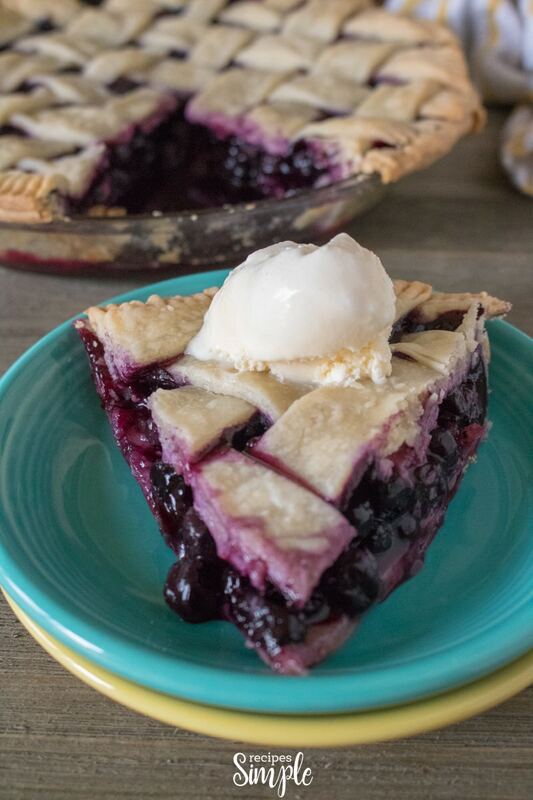 We are huge fans of fruit pies and peach and Blueberry are my favorites! 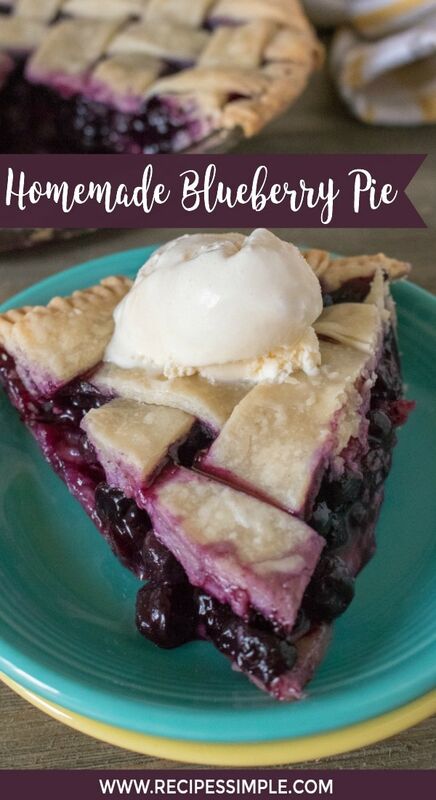 You can use fresh or frozen blueberries. If you use frozen blueberries thaw them before using. To avoid spillage bake pies on a cookie sheet lined with foil for easy clean up. If the outer pie edges start browning too much then cover them with a Pie Crust Protector Shield prevent additional browning. Keep the crust dough cool before using for a crispy and flaky crust. You can use a whole crust on top instead of a lattice crust if you prefer. Place a few slits in the crust with a knife to vent it. To save time you can use a pre-made pie crust instead of homemade. You can find them in the refrigerator section of your local grocery store. 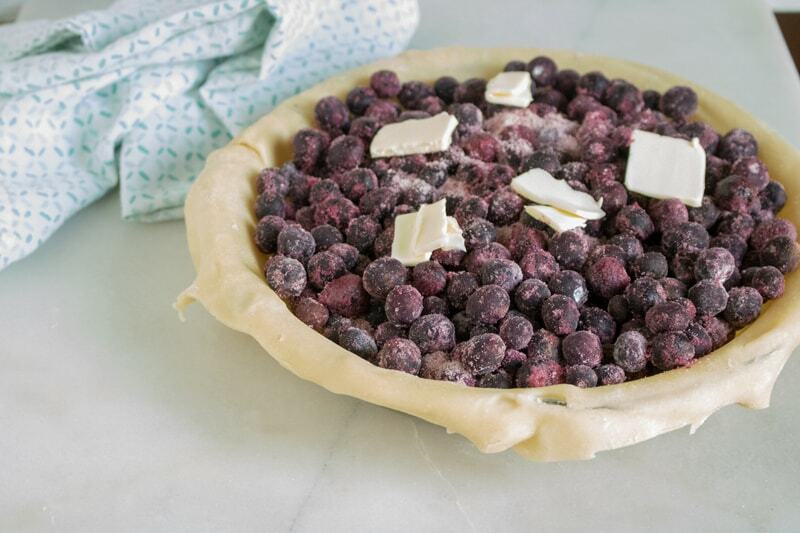 Let the pie cool before serving to allow filling to thicken and make it easier to slice. 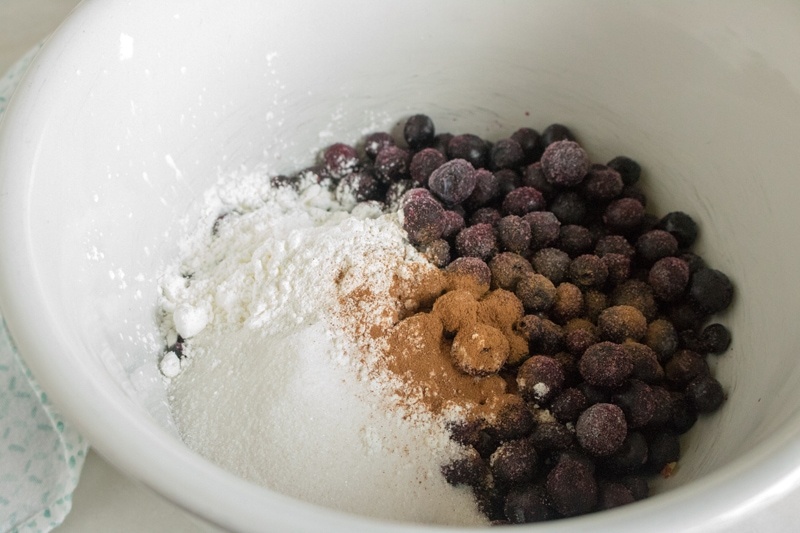 To make the crust, add flour, sugar and salt to a food processor and pulse to mix together. Add in the butter, cut into small chunks, and pulse until the butter is no larger than pea size. Add water in a little at a time and pulse. Remove the dough from the food processor and knead together, forming two 4-5 inch disc shape with the dough. Wrap the dough in plastic wrap and refrigerate for an hour or overnight. Preheat oven to 375. Roll out both of the pie crusts. Line pie dish with one of the pie crusts. 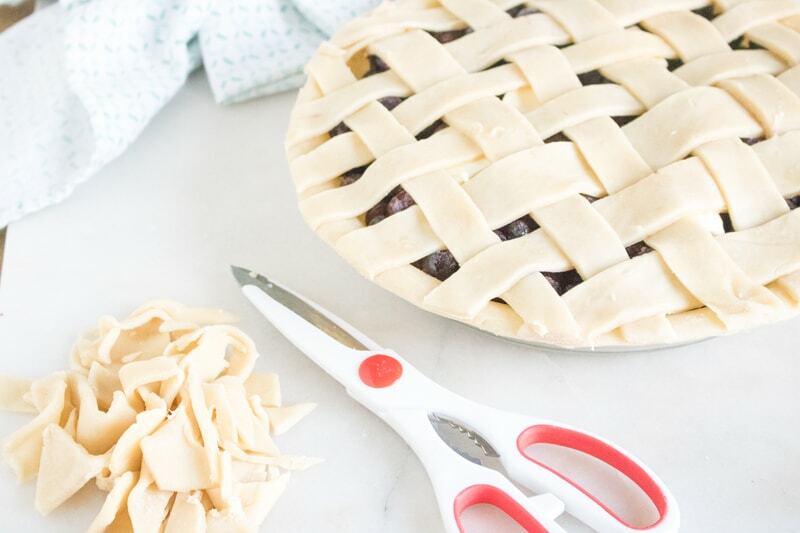 Slice the other pie crust into strips to make a lattice pie topping. In bowl mix the sugar, cornstarch, salt, and spices. 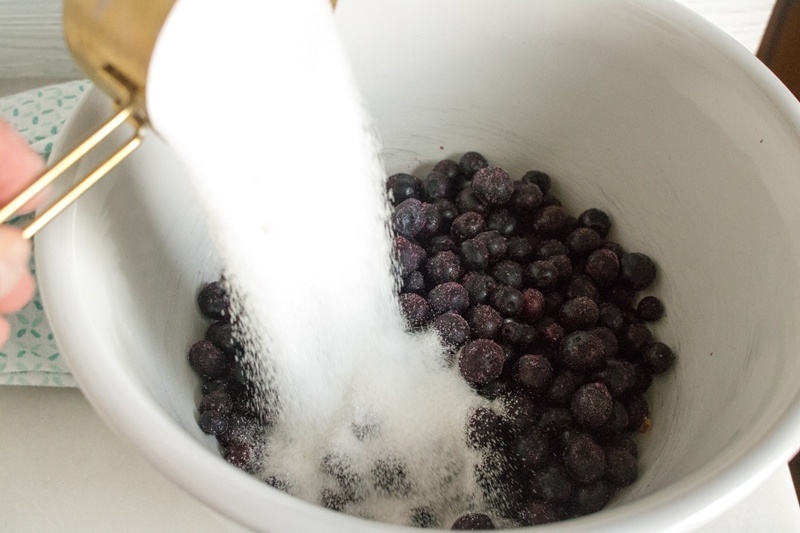 Add blueberries and gently toss until combined. Pour blueberry mixture into crust in the pie dish and add dabs of butter. 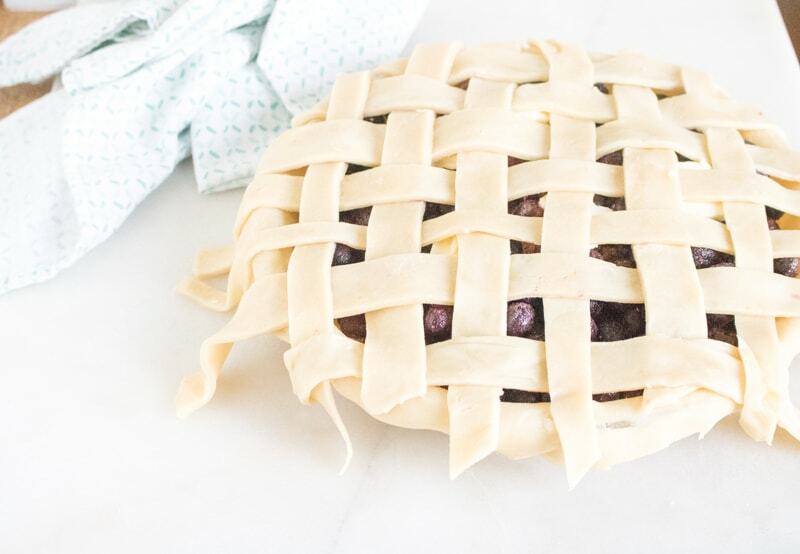 Then cover with the lattice crust and trim off the edges. Bake at 375 for 50 minutes to 1 hour. Lattice crust will be a light golden brown. This delicious homemade Blueberry Pie recipe is filled with fresh plump juicy blueberries in a made from scratch lattice crust. To make the crust, add flour, sugar and salt to a food processor and pulse to mix together. Add in the butter, cut into small chunks, and pulse until the butter is no larger than pea size. Add water in a little at a time and pulse. Remove the dough from the food processor and knead together, forming two 4-5 inch disc shape with the dough. Wrap the dough in plastic wrap and refrigerate for an hour or overnight. Preheat oven to 375. Roll out both of the pie crusts. Slice the other pie crust into strips to make a lattice pie topping. Mix the sugar, cornstarch, salt, and spices in large blow. Add blueberries and gently toss until combined.